We are a dynamic travel centre, specialising in tourism and travel to Israel and have been servicing travelers of all denominations seeking to experience the wonders of one of the greatest cultural bastions of the world – Israel for over 25 years. We have been successfully handling travel arrangements for groups and individuals, together with a strong relationship with El Al Airlines and a professional network of tour operators and hotels in Israel. Whether this is your first time to Israel or you have been before, we have the knowledge and expertise to plan an itinerary to suit your dreams and needs, and ensure your journey is memorable. 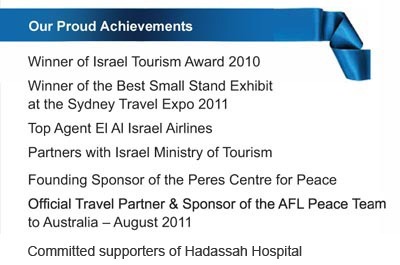 As the “Australian Participant at Israel Peace Tourism Conference”, we believe that tourism and travel at its finest level may build bridges of peace and understanding between peoples and cultures.